Home Blog Pet Care Safety Can Cats Take Benadryl? Many people are allergic to cats, but cats get allergies of their own. Like humans, cats with allergies get itchy skin. Unlike humans, they scratch excessively, bite or chew, and lick the fur off an irritated patch of skin to relieve the itch. One of the most common treatments for cats with itchy skin is an antihistamine medication called Benadryl (diphenhydramine). The dose is much lower for cats than people, so you still need to go to a veterinarian first. However, Benadryl has many benefits. If you’ve ever taken Benadryl for allergies, you know it can make you feel sleepy. This is why Benadryl is so useful for traveling with cats on long road trips – especially cats who get motion sickness in the car. If you think Benadryl might help with your cat’s allergies or traveling, check with a veterinarian. Not all types of Benadryl are the same, and some types contain ingredients that can cause side effects in cats. For most cats, however, a low dose of Benadryl is a popular remedy for some of the most common health problems— itchy skin, excessive scratching, seasonal allergies, allergic reactions to fleas or bug bites, and anxiety or car sickness while traveling. Benadryl® is an antihistamine. The active ingredient is diphenhydramine, which is sold on its own as a generic medication. Benadryl is sold over-the-counter by some veterinarian’s offices. It is usually the same medication you would buy for yourself at a pharmacy, but not always – so make sure you check the label. Some types of Benadryl have other ingredients that may not be safe for cats. What is a safe dose of Benadryl for cats? If you give your cat too much Benadryl, he can suffer an overdose and even die. Always talk to a veterinarian before giving your cat Benadryl. The “safe” dose is much lower for cats than people, so you may need to break up the pill or buy a product specifically for cats. The dose will depend on your cat’s age, body weight, and overall health. For example, kittens and elderly cats may need a significantly lower dose of Benadryl — or they may not be able to take Benadryl at all. What are the benefits of Benadryl? Benadryl is primarily used to relieve itchy skin and other allergy symptoms in cats. It is also sometimes used to relieve minor itching or swelling from bug bites, bee stings, or after vaccinations. Another benefit of Benadryl is that it is a mild sedative. This is useful on long car rides, or for cats who get motion sickness or travel anxiety. It helps calm them down and prevents nervous cats from vomiting. Benadryl can sometimes relieve coughing, but it depends on why the cat is coughing. Benadryl is most likely to work for cats with a dry cough or nasal congestion due to allergies, but not for lung infections. Can you give a cat Benadryl for traveling? Benadryl has a slight sedative effect that can help a cat feel more relaxed during traveling. Veterinarians will often recommend a low dose of Benadryl for cats who are going on long road trips in a car. However, it can be dangerous to give Benadryl to a cat before going on an airplane. Cats who are too sedated sometimes die on long flights because there are different oxygen levels on airplanes. The cargo area under the plane is jam-packed with luggage, and a heavily sedated cat might not get enough oxygen if he is breathing very slowly. If your cat has problems with vomiting due to motion sickness while traveling, it is usually because they are nervous. Benadryl might help, but you should also consider asking your veterinarian about a medication that is specifically designed to relieve nausea or anxiety in cats. Can cats take Benadryl for sneezing? Sneezing is caused by irritation of the nerves inside the sinuses. Just like humans, cats sneeze from time to time, and there are literally dozens of different conditions that can cause a cat to sneeze. If your cat is sneezing a lot, it is a good idea to go to a veterinarian and get a proper diagnosis. Benadryl can help your cat stop sneezing if he has mild seasonal allergies, but Benadryl will not relieve sneezing if your cat has a lung infection or another serious respiratory disease. Can cats take Benadryl for allergies? Benadryl is prescribed to cats who get seasonal allergies. For example, outdoor cats can get pollen allergies. Flea allergies are also extremely common. 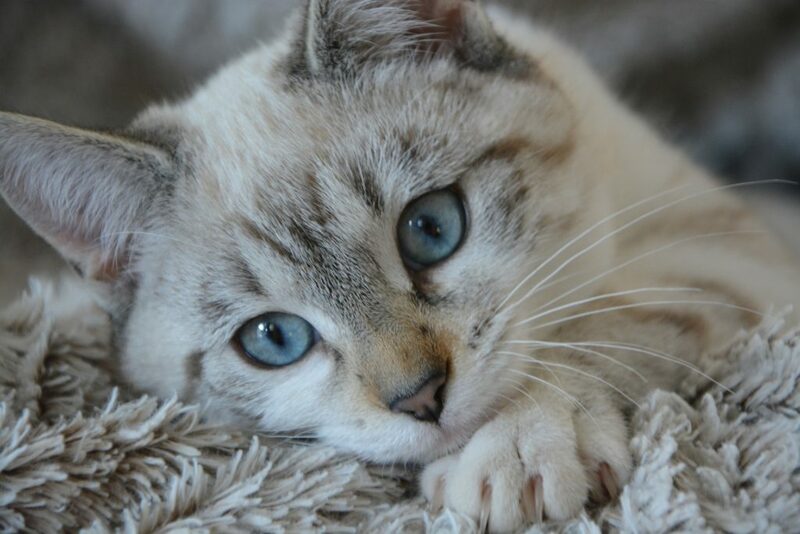 Unlike humans, cats with seasonal allergies usually suffer from itchy skin irritation instead of a runny nose. Benadryl can help make your cat feel more comfortable. Cats can also be allergic to things in their environment or your home. One of the most common allergens is soap residue in bedding. Cats are sometimes sensitive to perfumes or other scents in the home. If this is the case, giving your cat Benadryl will temporarily relieve the symptoms, but not treat the underlying cause. You need to first find out what is triggering the cat’s allergies and remove it from your home or yard. Can cats take Benadryl for fleas? Flea saliva is very irritating to cats. Just one flea bite can trigger an allergic skin reaction. You will probably see your cat licking, chewing, or scratching himself long before you ever see a flea. This is why veterinarians usually recommend flea medication for outdoor cats. Your veterinarian may also recommend Benadryl to relieve some of the itching until the flea medication has the problem under control. Can cats take Benadryl for bug bites? Benadryl can help cats who have mild itching from mosquito bites or bee stings. Bug bites are just as much of a nuisance for cats as they are for people. Cat fur does not provide much protection. Like people, cats are vulnerable to mosquitoes, fleas, ticks, bees, hornets, wasps, mites, and other insects. When an insect bites, it injects irritating saliva or poison into the skin. 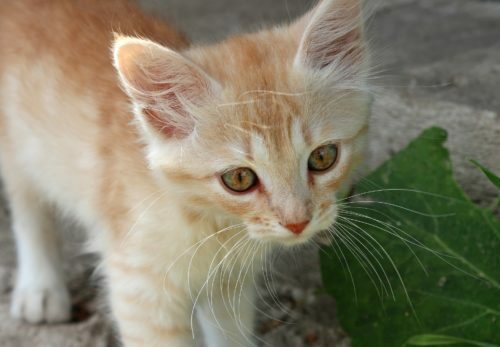 Some cats become more and more sensitive to bug bites over time, and an allergic reaction is the result. What if my cat is having a severe allergic reaction? Take your cat to a veterinarian immediately if you suspect that he is having a severe allergic reaction. Do not give your cat Benadryl to see if the symptoms disappear. 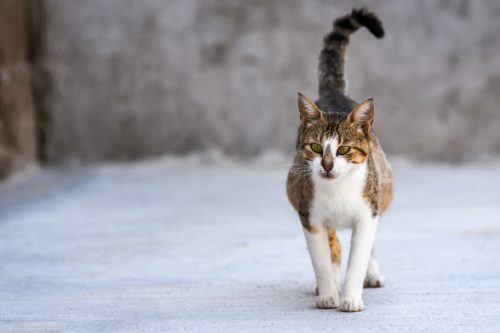 Just like people, cats sometimes experience a major whole-body allergic reaction known as “anaphylactic shock” from insect bites, bee stings, medications, food, vaccines, or other allergens. Benadryl is not powerful enough to stop the symptoms of anaphylaxis. The symptoms usually appear within minutes and may include severe itching, throat swelling, drooling, vomiting, breathing problems, diarrhea, urination, seizures, pale gums, coma, and even death. Should I go to a veterinarian before giving my cat Benadryl? As with any new medication, it is best to talk to a veterinarian to see if Benadryl might be the right treatment for your cat. A veterinarian will also make sure your cat gets the proper dosage of Benadryl — and ensure it won’t interfere with any other medications your cat is taking. A veterinarian will also check your cat for other health problems that might be causing the symptoms. If this is the case, giving Benadryl to your cat might actually hide a bigger problem. For example, if your cat is itching, he might have mites or an infection instead of allergies. Benadryl may temporarily relieve the itching, but it will do nothing for the underlying problem. By the time your cat is correctly diagnosed, the health problem could be a lot worse – and much harder to treat. What are the risks of Benadryl for cats? Benadryl should never be given to cats who are pregnant or nursing. It is also not safe to give Benadryl in combination with cold or sinus medications that contain diphenhydramine, because this could result in a deadly overdose. You should also use caution when giving Benadryl to cats who are taking sedatives, tranquilizers, barbiturates, or other CNS (central nervous system)-depressant medications. This is because Benadryl has mild sedative effects, so combining Benadryl with other sedative medications could result in a deadly overdose. Benadryl is an antihistamine, which means it counteracts a chemical in the body called “histamine” that produces the symptoms of an allergic reaction. Benadryl blocks H-1 receptors on the blood vessels, which prevents histamine from attaching to the receptors and causing inflammation or itchiness. In humans, allergies cause inflammation of the sinuses, which usually produces respiratory symptoms like a runny nose or sinus congestion. In cats, allergies primarily affect the skin. Cats with allergies typically experience skin inflammation and itching. Benadryl is not FDA-approved for cats, but veterinarians prescribe it at low doses to treat a variety of health problems in cats. The dose will depend on your cat’s size, age, and health, so you should make an appointment with your vet before giving your cat Benadryl. What are the side effects of Benadryl in cats? Benadryl can cause side effects like hyper-excitability, drowsiness, dry mouth, urinary retention, vomiting, diarrhea or loss of appetite. If you accidentally give your cat too much Benadryl, overdose symptoms include seizures, extreme sleepiness, coma, slow breathing or death. What should I tell my veterinarian before I give my cat Benadryl? Tell your veterinarian if your cat is on any other medications. Benadryl can interact with certain medications and cause severe side effects. You should also tell your veterinarian if your cat is allergic to Benadryl or any other antihistamines. Your veterinarian should know if your cat is pregnant or lactating, or has health conditions such as glaucoma, high blood pressure, prostate disease, heart disease, urinary problems, bladder disorders, or hyperthyroidism. Can an outdoor cat take Benadryl? Benadryl might be dangerous for an outdoor cat. The problem is that Benadryl will make the cat feel very sleepy and lethargic. The cat may also become clumsy or overly excited, which could cause injuries. Outdoor cats might also become too drowsy to defend themselves. Are all types of Benadryl safe for cats? A few types of Benadryl (or generics) contain a mix of diphenhydramine and other medications that may not be safe for cats. Always check the label before you give Benadryl to your cat. For example, Benadryl® Allergy Plus Congestion contains diphenhydramine plus a decongestant medicine called phenylephrine. Phenylephrine is generally safe when it is prescribed by a veterinarian, but too much can cause severe side effects in cats. Another example is Tylenol PM®, a cold-and-flu medication that contains diphenhydramine (Benadryl) plus acetaminophen (Tylenol). The toxic dose of acetaminophen in cats is very low — seen at as little as 10 mg/kg. That means giving your cat just one pill could be fatal.